This weekend, Mike DK3WN caught GOMX-3 downloading a good amount of data. See his post here. This data consists mainly of the satellite retransmitting a lot of beacons that were generated during the last 16 hours or so. GomSpace has recently released a complete parser for GOMX-3 beacons of type 1 0 (these are the beacons that contain ADS-B data). I have already incorporated this code into my gr-ax100 fork. The binary data in KISS format (almost 250KB) and the parsed beacon data received during this data download is in gist. Probably the most interesting thing is the ADS-B data. Below you can see all the aircraft on the map. Clicking on any of them will show the details for that aircraft. Since the orbit of GOMX-3 has an inclination of 51.6º, the satellite doesn’t usually detect aircraft above 55ºN or below 55ºS. 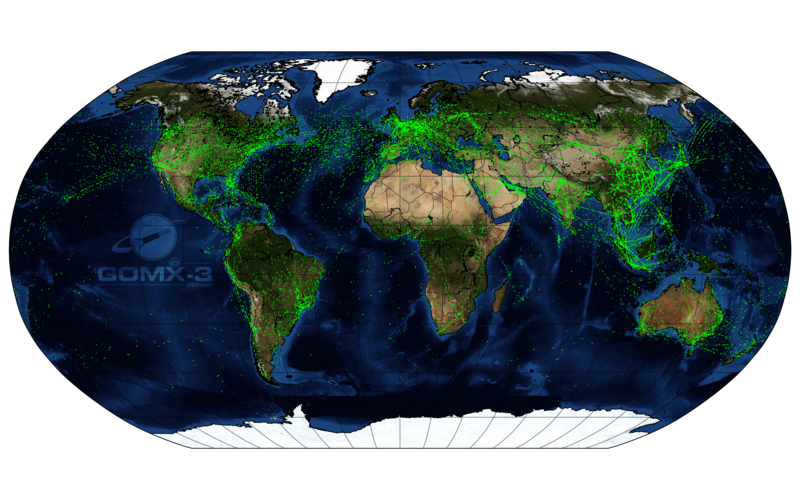 GomSpace has an image which shows lots of flights received with GOMX-3. There, the major air routes and hubs are apparent. A few days ago, I talked about the modulation and coding used by the satellite GOMX-3. Here, I will look at the contents of the CSP packets transmitted by this satellite.